Today’s Monday Words are a little different that the norm. We wanted to share a personal story of inspiration with you today. The story is unique to us, but one that is absolutely happening all around the world countless times a day. With the endless headlines of mass shootings, terrorism, or political debates, we felt it was time to open up and share some hope and inspiration from our personal life. For many reasons, we have quietly made a point not to talk about religion in this space. The main reason being that religion today is more devisive that connective. It has become the primary motivation for much of the world’s violence. Ultimately this has created fears and prejudice toward those who may associate themselves in any of these groups on any level. Another reason we don’t talk about religion in this space, is that in many ways we are still working out what it all means. We both grew up in incredibly loving Christian homes, have parents that work in the church, went to a private Christian university, and live in the south. But we, along with many of our friends, have been deeply hurt by the same churches we grew up learning to love. That pain is not unique to us and seems to be the leading cause of the decline in church membership all around the world. However, the lessons we grew up learning in the church are fundamentally so good. Love your neighbor, break bread with friends as often as you can, and live with a thankful heart. However, it seems like everything but that is being talked about these days. So as we are just a couple months away from bringing our own child into the world, we are left with the question of what do we pass on to our child(ren) about religion and the church. We still aren’t sure, but we do know the love your neighbor part is pretty important and worth telling a story about. Over the Thanksgiving holiday, we went to Texas and both of our families came into Houston to stay with my family. In our first dinner together we all laughed together and celebrated the new life we will be bringing into the world. But, we as every family probably did this Thanksgiving, we also talked about politics, the church, immigration, Donald Trump, ISIS, and gun laws. You know the typical thanksgiving things… We all fell on different sides of each subject and could only unanimously agree that the next night’s dinner would need to include proper tex–mex with a couple pitchers of margaritas. Of the hundreds of amazing tex-mex restaurants in Houston, we went to the closest taqueria just a couple miles away from my parent’s home. For those of you who haven’t been to a Texas Mexican food restaurant, you haven’t lived, but you also may not understand the dynamic. While Texas is pretty set on it’s anti-immigration laws, they don’t ask a whole lot of citizenship questions when it comes to Tex-Mex restaurants. Which makes the dynamic pretty much the same no matter where you go in Texas. Sort of legal-ish Mexican, Honduran, and Guatemalan families open a taqueria that is better than you could even imagine, work really hard and send most of the money home to their families. Typically, as a white kid growing up in the suburbs I didn’t think much of the situation as it seemed like a generally positive situation for everyone. However with deportation as a constant concern, the stories of the families of the taqueria and the guests aren’t often shared. Which means a known space is present between the two worlds, and generally this is the norm when we eat Tex-Mex. As we sat down and ordered a pitcher of ‘ritas, we immediately got back to our previous night’s conversation. Which meant our table soon became the loudest and most jovial table in the restaurant. By the time we got to our second pitcher of ‘ritas we were pouring an extra glass for our waitress, and after our orders were given to the kitchen we asked if she would join us at the table. Which seriously isn’t abnormal for our families to do. Both our parents have worked in some sort of ministry role our entire lives and the open invite to the dinner table is to be expected. With Megan obviously pregnant, the conversation with our waitress immediately opened up to kids and family. Which as I said before, isn’t typically something the staff likes to talk about at these restaurants. The fear of deportation is a real thing. However, that night our waitress trusted us enough to slowly open up and tell her story. Megan’s dad has a way of making nearly anyone feel comfortable to share their life story very quickly. While she politely declined a margarita, she did tell us she had been in Texas for six years and had a seven-year-old boy. Which opened up a whole conversation about us having a boy, and we started asking her a lot of questions about her boy. As our parents began telling stories about us at the age of seven, it slowly became obvious that our waitress didn’t have the same connection to those moments as our parents did. After a couple probing questions, she finally admitted that she hadn’t been able to fly back to Honduras in six years, which meant she also hadn’t seen her son since he was one. She was sending money home every month to give him and her mom a better life, and had watched him grow up via Skype, but hadn’t held him in six years. At this point, our entire table is in tears and coming around her to give her a hug. Within just a couple of moments, our family is giving her a group hug and Megan’s dad, a Methodist pastor, begins openly praying for her out loud. Which no matter how you or I feel about prayer, was incredibly moving and lovingly received. It did however, catch me off guard. But not because it was abnormal for him to do that, Megan’s dad is at a Santa Clause level of love and is always praying for and loving on people, but it was what happened next that caught me off guard. As the check arrived and both of our parents began to politely make a case for why they would be paying for the meal, I began to think about the overwhelming world events and topics we had talked about at the beginning of our meal and how it had all drastically shifted to a story of an individual. As the waitress walked away and out of hearing distance, it seemed almost in unison, that both parents agreed six years away from your child because of the price of a plane ticket was too much to walk away from. In a moment of extreme generosity, Megan and I watched them collectively leave a tip that would be able to purchase a ticket back to Honduras. Then quietly they got up and headed out to the car to leave. Before we were able to pull away, the waitress came out to the parking lot with another male waiter. She hugged us all one more time and explained that this was her brother who also worked at the taqueria and what this seemingly unwarranted generosity had meant to their family. Again more tears, more hugs and then we pulled away from the restaurant and headed home. Surprisingly our typically boisterous family was quiet and somber as we drove home. That night I was reminded of what it means to love your neighbor. As we wrestle with what traditions and areas of the church we want to pass along to our child, where our own pain and disappoint lies in the system we have grown up in ourselves has affected us, we will forever be impacted by the honest, and pure love we saw in both of our parents that night. As February, our due month, quickly approaches we are just now truly beginning to understand what it means to love and parent by example. We know not everyone grew up with parents like this, and that is why I felt like it was important to share this story. While we may not all have had parents like this as our example, we can all be this example to our children and our neighbors. I think in times of global unrest and violence covering the news, these stories of hope are more important than ever. Please feel free to leave any stories of your own in the comments, we would love to hear yours. These are the stories that need to be remembered, retold, and passed along. There is no doubt that loving those around you well and setting our personal interests and thoughts aside even for just a moment can make the world seem smaller, better, and more hopeful. Since 2011, I have been traveling to Honduras to spend time and serve children in group homes there, many of whom are separated from their families in America. You have no idea how much this touched my heart! Thank you for sharing this touching story! Your parents made an incredible gesture that truly impacted someone’s life for the better — and will not soon be forgotten. You both are fortunate to be welcoming your child into a family that honors these principles and wants to leave the world better than they found it. A beautiful story for the start of a new week! Wow, what a beatiful story. I appreciate your honest in sharing this and I hope it inspires others to extend that generosity. I know it inspired me. Well said and beautifully written. Thank you for sharing this beautiful story. I struggle with these thoughts too – while wrestling through my own faith journey, how do I begin to sum up what I believe to articulate to another? I keep coming back to hospitality and compassion. To ourselves, to those we surround ourselves with, and to strangers. These two are upheld across religious categories, and I think they make the world go ’round; hospitality, compassion, all with a deep love for ‘thy neighbor’. & what a great example this story is. oh goodness!! I am grateful you have shared this story of giving! Brought me to tears.. and tears of joy, not the ones of horror and angst that I am used to shedding these days! Thank you to your families for the gift of love & neighborliness! This is such a beautiful story, thank you so much for sharing. Kindness like this to (basicly) strangers totally restores my faith in humanity at times like this when there is so much tragedy going on in the world. So touching and inspiring! I love this story Megan. tears. i hope you’ll continue to share more like this in such a gracious way. Love you guys. Wow. This completely moved and challenged me. My heart is truly warmed and inspired by the generosity of your family. To know that this woman’s family has been forever changed by this act of love is beautiful. Thank you for sharing this! 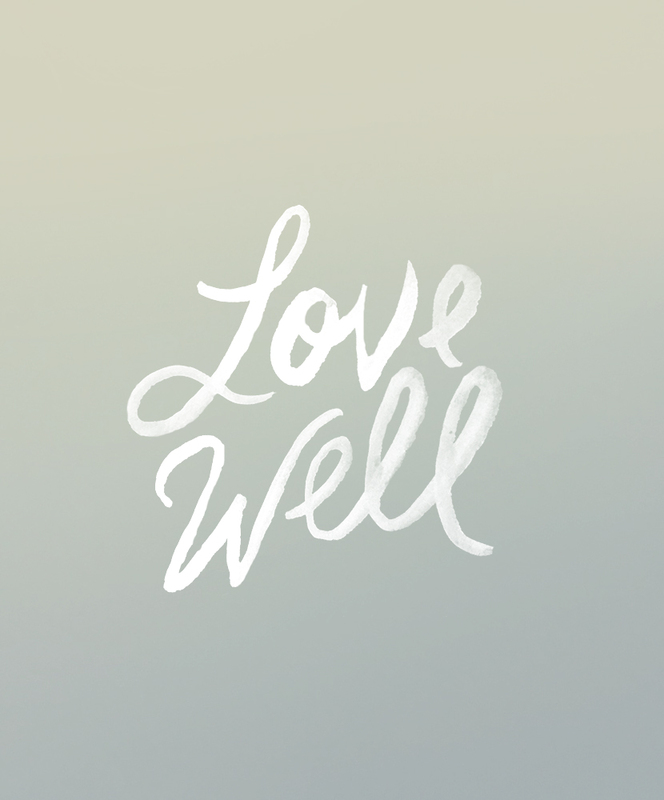 What a beautiful example of loving well! Thanks for sharing a more personal story! Incredible LOVING story. Thank you for sharing. I am in john’s new church and I’m happy to have even more of John and Becky’s LOVING spirits revealed. got me right in the feels. what a great story! what amazing people! Beautifully written and what a beautiful story. i have tears streaming down my face. thank you for your incredibly gracious parents and for sharing with us. that’s a great story, and i’m really happy you feel comfortable sharing it here. more compassion is what the world needs now. you never truly know someone until you talk to them, know their family, hear their story, understand their point of view. or at least try to imagine their struggle as yours. there’s a good chance we have it better we all know. While i grew up going to church (here and there, ha) i’d call my adult self spiritual, not religious. what always gets me is that, for many religious folks, it seems you can only have compassion, love they neighbor, and be a good person if you’re doing it through the bible and for god. it’s something i sadly have read in facebook responses, and it’s the kind of statement that just makes the rift between folks deeper. by no means is that what i inferred from your post, but it reminded me of ugly conversations i’ve witnessed (here in texas, of course). your parents are obviously full of compassion, which is what we all need more of – race, religion, gender aside. Love. This. In every way. Very moving post. My family immigrated from HOnduras when I was 16, under very different circumstances, but I know very well what most people go through to simply survive. It’s like an open wound, really. Your story speaks to me on so many levels. I have walked away from the church, but not from the lessons found in Jesus’s life, of love, forgiveness and kindness. Thank you for sharing, you have made me cry.